In Turkish popular lore, the denizens of Kilis, a town in southeastern Turkey right near the Syrian border, are known for two things: kebab-making and smuggling. We haven’t been to Kilis, so we can’t vouch for the smuggling bit. But we did recently have lunch at Öz Kilis, a wonderful little spot on a quiet back street in the Fatih neighborhood run by two Kilis natives, and can report that the kebab making-reputation is well deserved. Not just any kebab, mind you. Clearly an unorthodox and clever lot, the people of Kilis have a distinctly different approach to cooking meat. 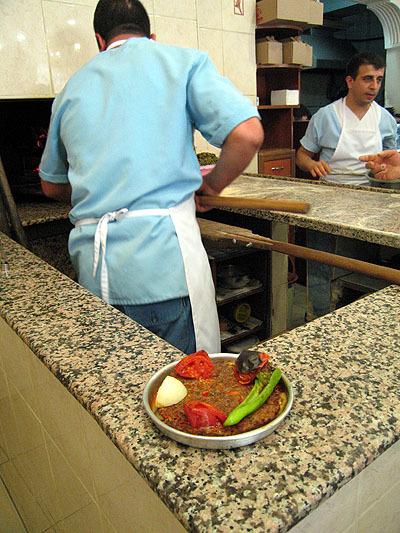 While a wide swath of humanity stretching from the Balkans to the Hindu Kush makes their kebabs by putting meat on a skewer and cooking it over a fire, the people of Kilis are famous for their pan kebab, a thin disc of ground meat that is cooked in a shallow metal dish that’s put in the oven. It’s a kind of Turkish meatloaf – only juicier, spicier and, well, better than any other meatloaf we’ve ever had. Why make kebab in a baking pan, you may ask? We asked the question of Hasan Küçükoğlu, one of Öz Kilis’s owners, who simply answered, “It’s our specialty. It tastes better that way.” Realizing that we’re dealing with a native of Kilis, we figured there’s something he probably wasn’t telling us. And, indeed, there was. After a bit more prodding, it turned out the pan kebab is the delicious result of ingenuity fueled by necessity. In Kilis (and other towns along the Turkey-Syria border), one takes their circular baking pan to the butcher, buys a few liras’ worth of meat that the butcher minces and mixes with herbs and spices, puts the mince into the tray and flattens it into a big, thin patty and then takes it to the nearest bakery where it is cooked to perfection in the bakery’s large oven. No need to mess around with cooking at home. At Öz Kilis, the pan kebab is served personal size, in a dinner-plate sized tray. Underneath the flavorful and red pepper-infused ground meat lies a layer of thinly sliced eggplants that have turned meltingly soft during the roasting in the restaurant’s brick oven, while on top are chunks of tomato and green pepper that have also been roasted. On the side was a refreshing salad of extremely finely chopped onion, tomato and parsley that was livened up with piquant pomegranate molasses. More like gazpacho than a salad, we ate it with a soup spoon. The restaurant also turns out very good lahmacun, another Kilis specialty. Like with kebab, the good people of Kilis take an unorthodox approach to making this classic item, offering something we’ve never seen anywhere else: garlic lahmacun. Where other lahmacuns are covered with a reddish minced meat and tomato mix, this one is heavy on the parsley, coming out of the oven a beautiful green and flecked with small chunks of garlic whose flavor has mellowed during the roasting process. We finished our meal with a glass of exceptionally strong tea, the kind served in southeast Turkey and known as kaçak çay (“smuggled tea”), usually made from tea brought across the across under the authorities’ nose. We quietly enjoyed our Kilis tea, this time asking no questions. There sounds like there’s a lot of great Kurdish places in Fatih–we have got to get there! What makes you think they’re Kurdish? Not that there’s anything wrong with it but I’m just curious. As far as I know, there aren’t many Kurds in Kilis. Congratulations on your wonderful review. As someone with both parents from Kilis, I must say you have done Oz Kilis justice, their food has the approval of all the real “Kilisli” of my acquaintance. I would like to add one or two things that the more curious might find edifying. Lahmacun is prepared two ways in Turkey, there is the Kilis type that is made with onions and the Antep type that is made with garlic and herbs (parsley). Ironically, what you had in Oz Kilis (Antep or Gaziantep are neighbors and rivals of sorts) seems to be the Antep kind of Lahmacun. @Jgibbs Kilis is a very unique combination of people but is definitely not what anyone would call “Kurdish Place” if anything, due to its location, there is more of an Arab influence than anything else. One side of my family has its roots in Konya while the other Crimea by way of Istanbul.